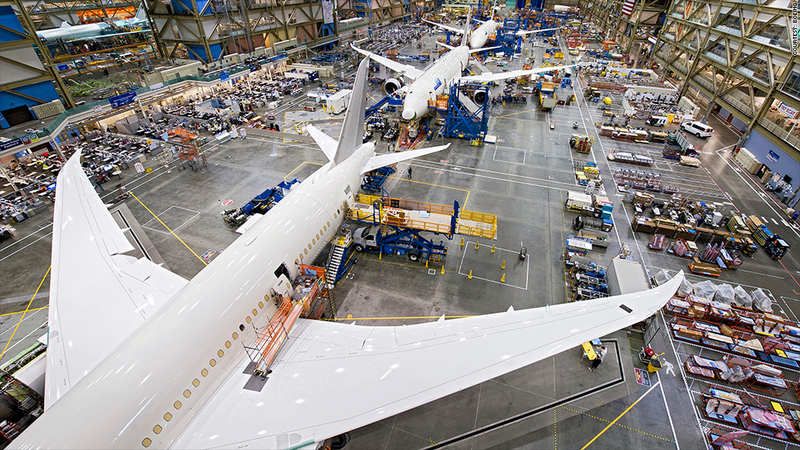 Boeing assembles its 787 Dreamliners in Everett, Wash. (above) or North Charleston, S.C.
Boeing's 787 Dreamliner, currently grounded by U.S. and international regulators for a safety issue tied to batteries, is assembled in the United States but made from parts sourced worldwide. As many as 45 big companies are involved in building the main components -- the fuselage, engine, airframe, bulkhead and tires -- of the $200 million 787 Dreamliner, according to Boeing (BA). And when you account for subcontractors that supply nuts and bolts, electronics and software for the aircraft, the total number of suppliers could be well over a hundred, estimates Richard Aboulafia, aviation analyst and vice president with Teal Group Corp., an industry consulting firm. The Dreamliner is Boeing's first jetliner whose primary structures -- body and wings -- are built with lightweight composite materials such as graphite, titanium and carbon fiber rather than traditional metals, Aboulafia said. "This makes the aircraft lighter and more efficent than previous models," he said. Another big difference, he said, is that the Dreamliner uses mostly electrical power rather than pneumatics to control the aircraft. That power system uses lithium-ion batteries, which are at the center of this week's grounding. The Dreamliner is assembled at Boeing's two facilities in Everett, Wash., and North Charleston, S.C. But its parts come from around the world. About 70% are supplied by American companies and 30% are outsourced, said Boeing spokesman Larry Wilson, which is about the same ratio as similar Boeing aircraft. Wilson declined to provide the exact dollar value of parts. Among its major American suppliers are Iowa-based Rockwell Collins (COL), which makes the Dreamliner's communications and pilot control systems; Kansas-based Spirit AeroSystems Holdings, which provides the fuselage parts; General Electric (GE), which produces the engines; and Honeywell (HON), which supplies the navigation systems and flight control electronics. Many of the Dreamliner's other suppliers are based overseas in countries including Japan, Italy, Korea, Germany, the United Kingdom, Sweden and France. For example, Italian firm Alenia Aeronautica makes the center fuselage, French firm Messier-Dowty makes the aircraft's landing-gear system, German firm Diehl Luftfahrt Elektronik supplies the main cabin lighting, Swedish firm Saab Aerostructures manufactures the access doors and and Japanese company Jamco makes parts for the lavatories, flight deck interiors and galleys. French firm Thales makes the Dreamliner's electrical power conversion system. Thales selected GS Yuasa, a Japanese firm, in 2005 to supply it with the system's lithium-ion batteries. Boeing's vendors likely picked the higher-energy, lighter-weight lithium ion batteries -- the same type found in mobile phones and laptops -- to make the Dreamliner's unique electrical architecture function more efficiently, said Aboulafia. 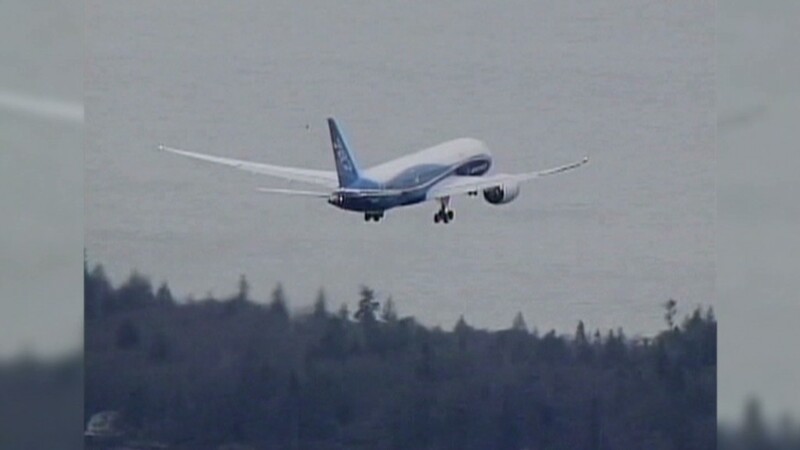 Aviation authorities worldwide ordered airlines to stop flying Boeing's 787 Dreamliner over fire risk associated with battery failures aboard the aircraft.